Given the narrow constitutional provisions governing the dismissal of a prime minister, only the country’s parliament or Supreme Court can sort out the mess President Sirisena has created by replacing Ranil Wickremesinghe with Mahinda Rajapaksa. Note: This article was first published on October 29, 2018. On Friday October 26, the United People’s Freedom Alliance (UPFA) announced it was withdrawing from Sri Lanka’s National Unity government. Later in the evening, President Maithripala Sirisena purported to appoint Mahinda Rajapaksa as prime minister. At the time, Prime Minister Ranil Wickremesinghe had not yet ceased to hold office through one of the constitutionally stipulated means. Questions surrounding the constitutionality and legality of the decision to remove Wickremesinghe and appoint Rajapaksa have plunged Sri Lanka into an unprecedented constitutional crisis. Wickremesinghe continues to assert that he is the country’s prime minister, and has refused to vacate Temple Trees, his official residence. The president, in turn, has denied a request from Wickremesinghe to convene an emergency session of parliament and has prorogued parliament until November 16. In the aftermath, few explanations have been offered to justify the constitutionality of the move, and much has been discussed concerning the prospect of defections to Rajapaksa; the possibility of a Supreme Court determination; as well as the possibility of impeaching the president. As discussed in length elsewhere, Wickremesinghe had not legally ceased to hold the office of prime minister at the time of Rajapaksa’s purported appointment. Articles 46(2) and 48 of the Sri Lankan constitution provide that the prime minister can cease to hold office only by death, resignation, by ceasing to be a member of parliament, or if the government as a whole loses the confidence of parliament through a no confidence vote, a defeat of government policy or the budget. None of these circumstances had transpired on Friday. In fact, in April this year, Wickremesinghe actually defeated a no confidence motion by 46 votes. On the same day as the purported appointment of Rajapaksa, President Sirisena wrote a letter citing his powers under Article 42(4) of the constitution, and informed Wickremesinghe that the latter had been removed from the post of prime minister. However, Article 42(4) refers to the president’s power to appoint as prime minister, a member of parliament who in his opinion can command the confidence of the house. There are no provisions in the constitution concerning the removal of a prime minister by the president. A prime minister can only cease to hold office through one of the stipulated means in Articles 46(2) and 48. When forming an opinion as to which individual can command the confidence of parliament, it is commonly understood that that a candidate should have the support of the majority of the members of parliament. In a televised statement the President Sirisena asserted that the decisions to remove Wickremesinghe and appoint Rajapaksa “were made totally in accordance with the constitution and on the advice of legal experts”. The remainder of the statement focused on the president’s concerns about the substance and the manner in which Wickremesinghe governed. However, it did not shed any light on what grounds the president believed the dismissal of Wickremesinghe or the appointment of Rajapaksa was constitutional or legal. Further the statement made no reference at all as to why the president believed that Rajapaksa could command the confidence of Parliament. Rajapaksa’s allies have advanced arguments defending the constitutionality of the move, citing article 46(2) of the Sinhala text of the Constitution, arguing that as the UPFA withdrew from the cabinet, the cabinet ceased to exist, and therefore the prime minister also ceased to exist. Further they have relied on section 14(f) of the Interpretation Ordinance to argue that as a rule whoever has the authority to make an appointment similarly has the power to remove an individual from office. However, even momentary pause to consider the argument raises questions as to its logic. Article 46(2) provides that the prime minister can only cease to hold office where he resigns or ceases to be a member of parliament. Article 48(1) provides that the cabinet can be dissolved in the following circumstances: where the prime minister dies, resigns or otherwise ceases to hold office; where the parliament rejects the statement of government policy or the appropriation bill; or where parliament passes a no-confidence vote in the government. The resignation of some members of the cabinet from government does not automatically render the cabinet dissolved. Further, under Article 48(1), the prime minister must cease to hold office through one of the stipulated means, prior to the dissolution of cabinet. Additionally, the Supreme Court in a number of decisions has ruled that the Interpretation Ordinance does not apply to the constitution. Further, it is spurious to argue that a broad provision in the Interpretation Ordinance concerning the powers of removal and appointment could be applied to the prime minister. Relying on the Sinhala text, which in any event does not meaningfully differ from the English text, also does not help the cause. Unlike ordinary legislation, the constitution does not explicitly provide that the Sinhala text prevails over the English text. The clearest way out of the present crisis is to demonstrate that either Wickremesinghe or Rajapaksa has a parliamentary majority, which requires the support of 113 MPs. In 2003 following a decision by the then president to prorogue parliament without the consent of the speaker, the latter ruled that in such instances the majority of MPs should have the right to reconvene Parliament. As of Monday morning, in addition to Wickremesinghe, the leader of the Janatha Vimukthi Permuna (JVP), Anura Kumara Dissanayake, and Opposition leader R. Sampanthan have written to the speaker requesting that parliament be reconvened. Taken together, Wickremesinghe, Dissanayake and Sampanthan lead more than 129 MPs. With the UPFA’s departure from the ruling coalition, Rajapaksa has the support of 95 MPs. 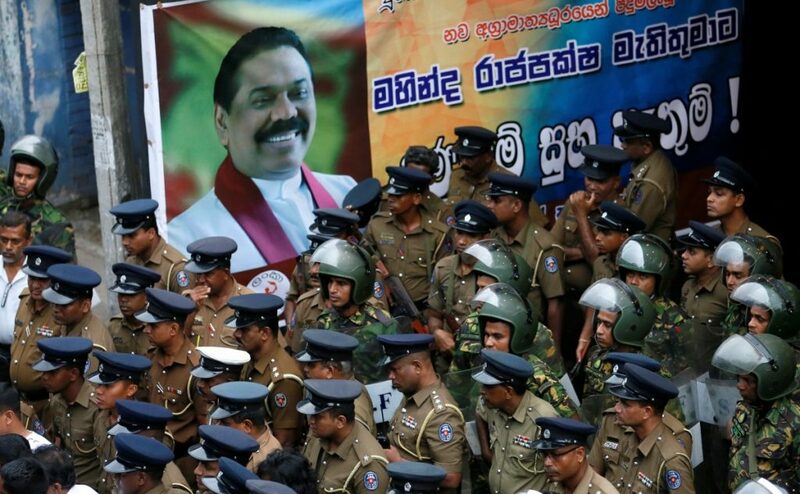 At least officially, Rajapaksa is 18 short of the required 113 members needed to demonstrate a majority. Wickremesinghe has the support of 106 MPs, including 86 MPs from his own party, and 19 MPs from six other parties that form the United National Front (UNF). MPs allied with Rajapaksa have indicated that 21 members of the United National Party (UNP) are willing to join hands with Rajapaksa. If Rajapaksa has the parliamentary majority he claims, it is unclear why this was not demonstrated at the outset, prior to removing Wickremesinghe. The decision to prorogue parliament until November16 could suggest that Rajapaksa is short of the required parliamentary majority. As of Sunday, it has been reported that five UNP MPs are willing to defect to Rajapaksa. However since then, at least two of the concerned MPs have stated that they either do not intend to defect, or have not made up their mind. Similar to other parts of South Asia, Sri Lanka has a weak anti-defection legal framework. Article 99(13) of the constitution says that an MP can be expelled from parliament provided they cease to be members of the party to which they belonged, at the time they were elected. However, the expelled MP is permitted to seek a determination before the Supreme Court that his expulsion was invalid. If the expulsion is ruled to be invalid, the seat does not become vacant. Over the years, the Supreme Court has been more than willing to rule in favour of expelled members of parliament, citing procedural irregularities and the lack of adherence to principles of natural justice in the process of expulsion. More recently, members of parliament have sought to prevent their expulsion by obtaining stay orders against the disciplinary proceedings from lower courts. The draft 19th Amendment to the Sri Lankan constitution sought to clamp down on defections by limiting the jurisdiction to hear matters pertaining to the expulsion of MPs to the Supreme Court. However, the provision did not make it into the final version of the amendment. If any members of the UNP were to defect, they face the possibility of being expelled by their party, and as a result risk losing their seat in parliament. However, if any of the parties that form the coalition were to cross as a whole, then this would not raise questions of expulsion from the party or the parliament. On Saturday evening, all the party leaders that form the UNF, have indicated their support for Wickremesinghe. It was reported on Sunday that the UNP was in the process of collecting affidavits from MPs stating their explicit support for Wickremesinghe. Securing affidavits pledging support to Wickremesinghe would amount to a public show of strength and could also prove useful in defending the procedural validity of the expulsion of defecting members. Under the Sri Lankan constitution, executive acts can be challenged through fundamental rights applications. Article 12 of the constitution, which provides for the right to equality, has been used to challenge a broad array of executive action. Theoretically, it is possible that as early as Monday, the constitutionality of Friday’s ouster could be challenged before the Supreme Court. However, given the cautiousness of the Sri Lankan judiciary in sensitive political cases, it is unlikely that any of the political stakeholders would wish to seek a resolution of the current crisis before the Supreme Court. It has been reported that members of the UNP are discussing the possibility of impeaching President Sirisena. Under Article 38(2) of the constitution, the president can be impeached on a number of grounds including the “intentional violation of the constitution”, and “misconduct or corruption involving the abuse of powers of his office”. The first step of the impeachment process is providing notice of a resolution to initiate an impeachment to the speaker. Such a notice must be signed by at least half of the total number of MPs, and the speaker must be satisfied that such an allegation merits inquiry, before the notice of such resolution can be placed on the order papers of parliament. In a letter to President Sirisena, speaker Karu Jayasuriya indicated that he believed that Wickremesinghe still has the confidence of parliament, and that prorogation of parliament should have been done with his consent. Therefore, if presented with a notice of a resolution, the speaker maybe inclined to agree that allegations of violations of the constitution or abuse of power merit further inquiry. If the UNP did secure the signature of half the MPs for a proposed impeachment motion, it would be a strong indication that Wickremesinghe commands the confidence of a majority of parliament. The actual process of impeachment requires that two-thirds of [arliament to pass a resolution referring the allegations against the president to the Supreme Court. Following which the Supreme Court is required to conduct an inquiry and forward a report of its conclusions to parliament. If the Supreme Court concludes that the president is guilty of the allegations, then two-thirds of parliament must again support a resolution to oust the president. Given the current arithmetic in parliament, it is unlikely that such a process would be successful. Another way to resolve the current crisis is by resorting to an early parliamentary election. However, under the 19th Amendment to the constitution, the president cannot dissolve parliament until the last six months of the parliamentary term, without the support of a two-third majority of parliament. Thus, the current parliament cannot be dissolved until February 2020 unless two-thirds of MPs pass a resolution requesting the president to do so earlier. Despite the cloud hanging over his appointment, Rajapaksa has assumed duties as prime minister, and steps are being taken to dismiss senior public servants and take over key state institutions. Reportedly plans are being made to appoint a new cabinet of ministers. If the appointment of Rajapaksa is determined to be unconstitutional and illegal, then all acts that follow could also potentially be illegal. There are no judicial precedents discussing the consequences of an unconstitutional appointment of the prime minister. Until parliament is convened or there is a Supreme Court determination, the constitutionality and the legality of actions of the government will continue to be questioned.